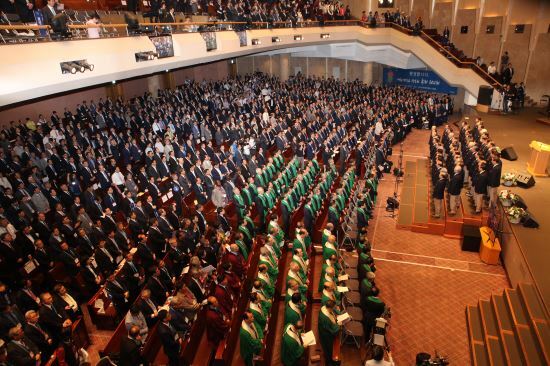 On August 29, the Presbyterian Church of Korea (PCK Tonghap) began distributing the 1,272-page Agenda and Report for its 103rd General Assembly, to be held from the 10th to 13th of September at Iri Shinkwang Presbyterian Church in Iksan, North Jeolla-do. The major agenda for the upcoming assembly include abolition of the Trials Department, which is at the center of the controversy over Myungsung Church’s hereditary succession of ministry, restructuring of general assembly bodies, and the homosexuality issue. In the activities report, PCK Tonghap Moderator Rev. Choi Gi-hak expresses thanks to the 67 presbyteries, 9,096 churches, and 2.73 million believers for their support. Pointing to successful ministries, Rev. Choi singles out the denomination’s village ministry seminar, relief efforts in response to earthquake damage in Pohang, North Gyeongsang-do, preparation for the clergy tax, and the denomination’s announcement of its official position on the homosexual issue. The moderator position will be turned over to current Vice-Moderator Lim Hyeong-seok. Due to the conflict over the Myungsung Church problem, Southeast Seoul Presbytery has not been able to confirm its delegates for the general assembly. Without this presbytery, the number of delegates is 1,464. The Myungsung Church issue is also noticeable among the overtures submitted by presbyteries to be included in the general assembly agenda. *Photo taken in September 2017 during the PCK Tonghap 102nd General Assembly, held at Yangjae Chapel of Onnuri Church. Photo provided by PCK Tonghap.